The goal of this post is not to describe HTML Applications or HTA. I will just give some basic info, if you want more, search for it or look into the msdn. Note: I am basing all my examples on Visual Basic Script since it is a format managed by macro_pack which I used for the proof of concepts below. HTA files are well known by pentesters as one of those "retro" ways useful to bypass application whitelisting. HTA files are also interesting to bypass antivirus because they are still not well detected. Last but not least HTA are used in web phishing, replacing old Java Applet attacks (the downside being that only Internet Explorer will attempt to run HTA "Applet" inside an HTML page). Here is an example of HTA file which was generated with macro_pack "HELLO" template. MsgBox "Hello from sevagas" & vbCrLf & "Remember to always be careful when you enable MS Office macros." & vbCrLf & "Have a nice day!" The HTA:APPLICATION tag is the mark of HTA application. The attributes of the tag here are meant to generate a minimized window that does not show in taskbar. Ignore the text talking about Office macro, HTA is not related to MS Office, you can use this file as a test file for the following examples. Note: If you feel more "offensive" you can use other macro_pack templates such as the WEBMETER template (meterpreter over https). See all options on macro_pack github. By default, HTA files can be called when you double click on them or with the command line. The tool which runs HTA is mshta.exe. You can find it in %windir%\system32\mshta.exe and %windir%\syswow64\mshta.exe. When HTA is called from the command line, mshta.exe will behave differently depending on the extension and the file format. If MSHTA runs an .html extension file containing HTML code with HTA application inside, it will run the HTA application but also execute HTML code. If you want to create a .htm file which can be called by both mshta.exe and a browser, put the HTA application in the header before it calls other scripts. An be sure to close your application. If you double click on the html file, it will open in browser. The browsers I tested will all ignore the HTA application (Except Microsoft browsers). If you run the html file with mshta.exe, your HTA application will be found, and run. HTA provides a way to embed a picture or an icon. This is done by prepending the binary content of the image before the HTA code. This is a normal usecase for HTA. If extension is ".hta", mshta.exe will search the HTA application and run the script with icon in task bar. If you rename file to ".ico" or other image extension, it will display the image in the HTA window and will not execute the script. - mshta.exe seems to execute script for non image extension. It is easy to build files which are both valid when opened with MSHTA and other applications, and unlike polyglot wizardry you see from Ange Albertini in PoC, these files are really easy to build! mshta %cd%\calc2.exe  -> Execute HTA script! So you can hide and run Visual Basic script in an executable binary! Exercice: Create an executable which calls itself with MSHTA to run the appended script. Exercice (advanced): Patch an existing executable with shellcode and HTA so that execution will run mshta.exe to execute the HTA script. What is a MS windows shortcut (.lnk extension)? Well basically Its a binary file which executes a command when you double click on it. For now lets focus on the part "its a binary". 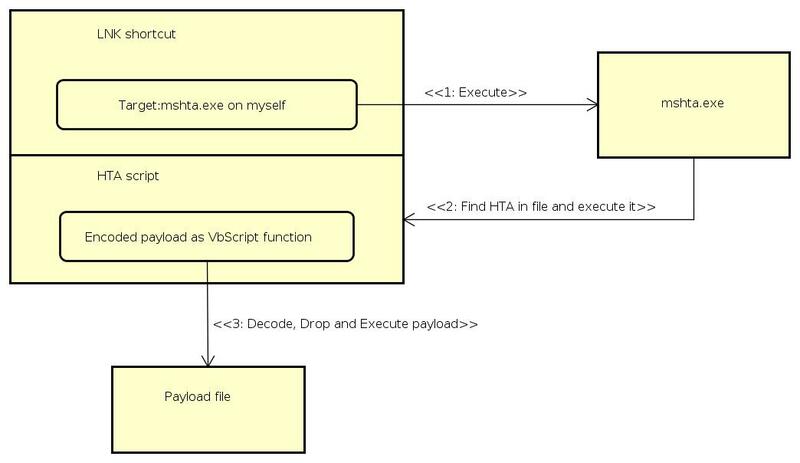 As we saw previously, mshta.exe will find and execute HTA scripts inside a binary. Lets check that LNK file can be turned into polyglot HTA script. If you double click on shortcut, it will resolve and open the txt file. mshta %cd%\readme.txt.lnk -> Executes HTA script! I hope you see where we are going ^^, but first, an easy polyglot exercise for the reader! IV.1) What to do with malicious LNK file? Its a binary file which executes a command when you double click on it. This article on blog.trendmicro describes various attacks relying on malicious LNK files. I think these APT guys do not have a lot of imagination. Instead of calling an HTA or SCT file over the Internet, why not just turn the LNK itself into an HTA application? In fact, you can modify the LNK target in a way it will use MSHTA on itself and thus, execute the script. That basically turns an LNK file into a self executable HTA file with a non .hta extension. Exercise: Create a file which is both a ZIP file and LNK file (with .lnk extension). The goal is to extract the zip archive when you double click on the shortcut (without any HTA code). IV.2) The magical picture trick! If we combine everything it is possible to have phishing, cmd execution, HTA script, and dropped payload all in one file and without any access to the Internet! Lets demonstrate that with a Magic trick! No knowledge of anything else on the computer except it’s a windows OS. Double click on the shortcut ==> A picture will be displayed! When you close the picture window, the shortcut is gone and replaced by the picture file!!! OK how to make this proof of concept: . The EMBED_EXE template combined with -e option will embed the given file inside the HTA code. At execution, the HTA code will drop the file, and execute it (which for a jpg file results in it being opened in the default image viewer). Note: -o option is for obfuscation to prevent some annoying AV yelling. Edit magic_dropper.hta, go to the end of the file and add the next code between calls to "autoopen" and "close"
Now the HTA file will delete itself after running. Right click on LNK to modify its properties. But it’s less versatile and we do not know the file path where the shortcut will be executed for your demo. %windir%\system32\cmd.exe /c start "" "mshta" "%CD%\magic.jpg.lnk"
Next, change the LNK icon to something related to an image (find one or just use an icon in %windir%\system32\shell32.dll). So we saw we could run an HTA file disguised as a shortcut, now lets do the same with a help file (.chm)! To build a CHM file, first you need an HTML help project (.hhp) file which is a text configuration file. See msdn for more information. The file contains various configuration settings. hello.chm will be the name of the created help file. The HTML source file which will be used is "hello.htm"
Next generate the CHM file. You can do that in "HTML Help Workshop" (File->Compile). Now double click on your help file to check it worked! All binary file format which can be used to start a command line can be turned into a vaild autonomous HTA script. Exercise: Make a MS Excel file with DDE field which calls MSHTA on itself to run an appended HTA script. How to avoid malicious usage of polyglot HTA? This "feature" could be prevented by requiring to have an HTA tag starting at the beginning of the file. One problem for example is this would break compatibility with all current HTA which relies on images. It is important to notice that attacking via malicious CHM, LNK, or HTA files is nothing new. But these formats are generally overlooked in security awareness trainings. Malicious LNK files in emails are generally flagged as SPAM/malware, but they can be very dangerous on a USB key, embedded in an Office document, or inside a ZIP file. CHM file is less likely to be considered malicious and same for other potential dangerous formats. For blue teams: Usually, if you don’t rely on HTA files, it is recommended to either disable all mshta binaries using application whitelisting or to link the .hta extension to notepad. This article showed that disabling .hta extension does not work.